Our challenge this month was to take a diagonal approach to our cards. I did that by diagonally stacking Washi Tape - leaving just a small space in between each line. Of course the sentiment is from PaperTrey Ink. I love the larger sentiments for a graphic card like this. You can't beat this technique for a quick and easy card. It probably took me less than 10 minutes to make this one. Your washi tapes are stunning and vibrant. Great card. What a fun way to use washi tape. Such a bright and fun card. Great colors and use of washi tape. I don't have any but every time I see it used so effectively I want to run out and get a few rolls. Bold and beautiful, love those bright colors! Great way to use washi tape! Love all the bright colors! Great job using washi tape. Love the colors. Really pretty. Love that your stripes went to the left. Great mix of patterns and colours! What a fun design! What a beautiful mix of patterns and I love that color combo!! What great colors! Love this! What a FUN card, Susie! 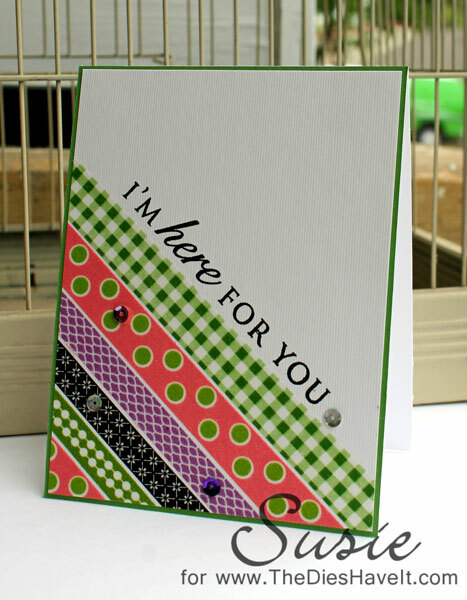 Love the bright colors & Washi tape! Perfect technique to use washi tape - love that there is a tiny border of white between the tapes! Absolutely fabulous!! Love all the color and I love that you used washi tape for your stripes!! Such a great idea! This is so pretty!! I love the Washi Tape. Fabulous card!! Hi Suzie! What an awesome card!